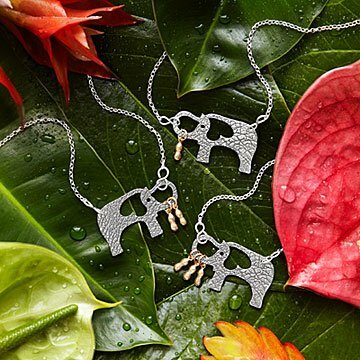 A sweet tribute to motherhood, this necklace features a silver elephant holding each of her little peanuts. There are some days when motherhood feels like being the ringmaster of a twelve-ring circus. But even so, it's those little nuts that are the most precious part of your life. Jewelry designer Trudy James celebrates that special bond between mother and child, but does so with a big top twist. Playing on the idea that an elephant never forgets, she symbolizes maternal love as a sweet momma pachyderm with a heart-shaped ear, holding in its trunk a precious cargo of tiny, bronze peanut charms--one for each of your own "little peanuts." Handmade in San Diego, California. Wear your family parade short or long with the two-inch chain extender. Make it a set! Click here to see the matching Elephant and her Little Peanuts Earrings. Sterling silver and bronze naturally oxidize over time when exposed to air and any corrosive materials. Store jewelry in airtight container to discourage oxidation and polish with a jewelers cloth when necessary. My mom loves this necklace!!! My wife will wear this almost daily to show that we have two wonderful little "peanuts"
You can wear this everyday. Will get many compliments, guaranteed. This was a birthday present with cute concept however not worth the prices. Quality or unique wise. My wife enjoys unique jewelry that is beautiful. She also enjoys jewelry that represents other parts of the world. And she loves uncommon goods. So when I went to look for a gift, this was a great place to come. Usually when I need a gift for her, I search until I find 2-3 gifts, then ponder which one would be best. But when I found this necklace, I stopped looking and bought it immediately. In short, my wife loves it. Bada bing bada boom. Waiting to give it to my daughter in September. This was a "push present" when my second child was born. Very cute "in the flesh"! This item alothough a great idea is poorly made, looks cheap, and is too short for even an adult with a slender neck.